These Domolo Thief's Crooks have been vetted as authentic, with signs of use and age. Held in the hand or worn over the shoulder, these curved staffs are the emblem of the society of yona (ritual thieves). The principal activity of the society seems to occur at the funeral of one of its members, stealing domestic animals to be sacrificed and eaten at the funeral ceremony. Each Dogon clan has a ritual thief. 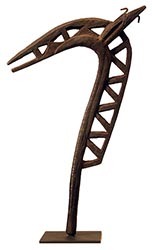 The staffs are called yo domolo (thief's staff ), and frequently have a hook-shaped form. 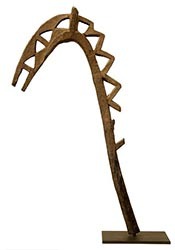 They are usually carved with with a zigzag motif symbolizing the rain (the mythical ancestor lebe), and with the hooked end resembling the head of a horse-like animal with pointed ears. It should be interpreted as a symbol of the horse that pulled nommo celestial ark to water after its fall to earth, or also as the mythical blacksmith stealing embers of the sun in order to create fire.